Usually I pack my lunch before going to work, but today I bought a cup of soup at the café on the first floor of the building where I work. 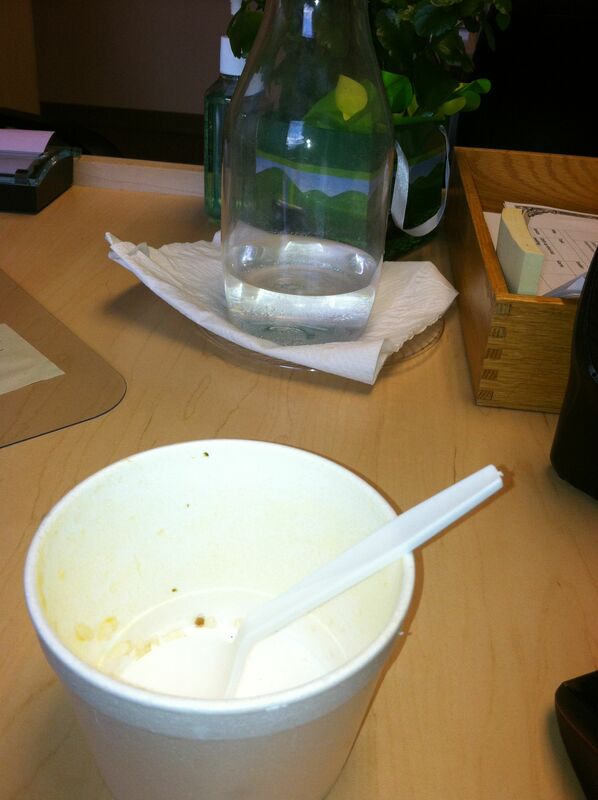 I burned my tongue on the thin broth while answering my email and searched the bottom of the styrofoam cup for bits of chicken and summer vegetables. After the soup I ate a handful of cherries, and an hour later, I was hungry again. Listening to my stomach growl, I wished I had brought something from home that might fill the empty gap. From the depths of my past came the memory of peanut butter and jelly sandwiches on my mother’s homemade bread. We rarely bought bread from a store when I was growing up. Instead, my mother made it from scratch, six loaves at a time, every few days. She mixed it in a large aluminum pail fitted with a hand-held churn. It took two people to start the mixing process- one to hold the bucket and one to work the churn, but in no time, the flour, milk, butter and yeast came together to form a giant ball, which she would turn out on the counter and knead until it was smooth. Once in a while, she used the side of her hand to form crease in the middle of the rounded loaf and spanked the “baby’s bottom.” We children would explode in peals of laughter and beg to give the bottom a spank too. From this basic white bread recipe, my mother made countless treats. She filled muffin cups with balls of dough to produce steaming dinner rolls that dripped with melted butter and sopped up gravy from Sunday’s roast. At Christmas she decorated stollen with a sugary glaze and candied fruit, and gave them as holiday gifts to our neighbors and friends. During the summer she fried dough and sprinkled it with cinnamon and sugar, creating a treat for hungry children who entered the house from the front door and exited from the back. She toasted bread for breakfast, sharing the crust with Greta, our collie shepherd, who preferred hers with a bit of peanut butter. On most days, however, Mom formed six even loaves, carefully kneaded and risen, and baked them three to a rack in an old gas oven. Half way through the baking, she moved the loaves on the top rack to the bottom, and vice versa, to ensure that they were evenly baked. She taught me to remove the golden loaves from the oven, dump them out of their pans and tap on the bottom with a finger. The ring of a hollow thump meant the loaf was fully baked. A dull thump indicated that the loaf needed a few more minutes in the oven, least it be gummy in the center. Placed on racks to cool, each loaf was coated with a thin layer of butter, so a soft crust would form. An hour later, the cooled loaves were sealed in plastic bags, ready for the next hungry batch of children. There was nothing like a peanut butter and jelly sandwich from my mother’s kitchen. A huge slab of bread was spread with Sultana peanut butter, which was sold in a huge yellow tub that was later used to collect sea shells and starfish at the beach. 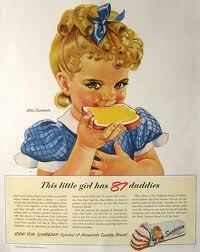 A second slab of bread was spread with strawberry preserves that Mom canned on hot June evenings. The slabs were gently pressed together and cut on the bias. Paired with a cold glass of milk, it was a filling repast fit for any king, or at least any kid. As a child, I didn’t understand why my mother made bread instead of buying it at the grocery store. My friends ate Wonder Bread, or Batter-whipped Sunbeam bread. Their sandwiches fit neatly into little bags, while mine were bigger, sloppier and had to be wrapped in flat sheets of waxed paper. It seemed to me that Mom could have been doing things that were much more fun than kneading and baking. I was right. Mom could have been doing other things. But to her, feeding her family was an extension of who she was. Her hands- the same gentle hands that wiped tears from little cheeks and pushed back bangs from sweaty foreheads firmly kneaded the loaves that would nourish her growing children. Every cup of flour was measured with care. Every slice of bread was a gift. A metaphorical kiss. A work of art laced with love. Wish as I might, there will be no peanut butter and jelly on my mother’s homemade bread for me, today, or any other day. But the memory is as sweet as Mom’s strawberry preserves, and the memory alone got me through to the next meal. And it made me think of the meals I cook for my family. Do I put as much love into the dishes I serve them? Hmmm…food for thought.